NNO (Nourishing Night Oil), contains the world's best moisturizing agent, contains the right quantity and combination of Jojoba Oil with the world's most powerful anti oxidant natural Vitamin E to overcome under eye darkness, dry skin, fine lines and wrinkles. According to a study by the Spin Control Institute of France NNO mimics the skin's natural oils to rejuvenate your skin and overcome dryness in just 2-3 weeks. 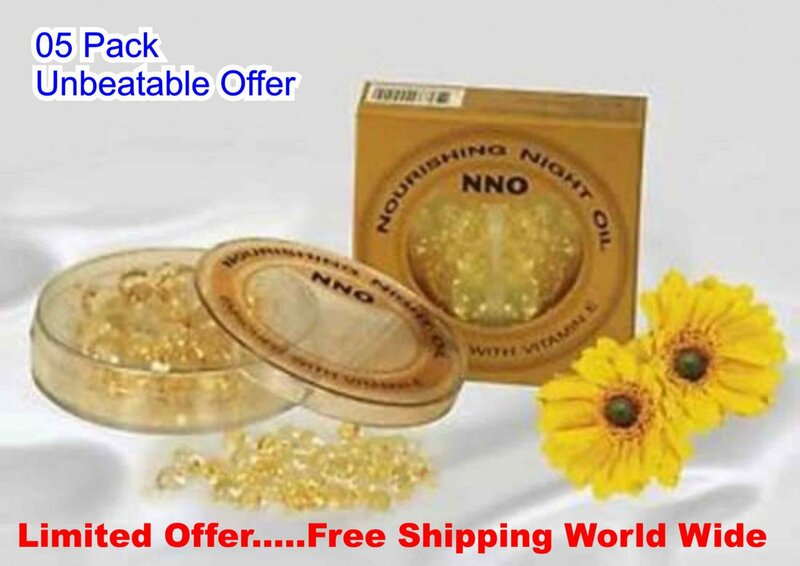 Each capsule of NNO contains: Natural Vitamin E (in the oil form) 4.70 mg Jojoba Oil 85.80 mg RECOMMENDED USE A soothing night care oil providing nourishment to revitalizes the skin. Helps minimize surface dryness caused by aging. How to open an NNO capsule- Simple, Free Image and File Hosting at MediaFire How to use NNO 1. Wash or cleanse your face before applying 2. Break the tip of NNO applicap with a sharp pointed object 3. Pour the content on your palm 4. Massage the oil well onto the face, neck and below the eyes, with a circular motion of the fingers Five-Star Service Is Our Goal!